Time to make this project official. After buying a salvage FZ, building it into a track bike, and racing it for a while I fall in love with the power and sound of this motor. I've debated getting another for street duty, but I just can't quite get over the look and riding position. I equally enjoy my R6, but most of the fun comes with high RPM and MPH that I have less interest for these days even on county back roads. 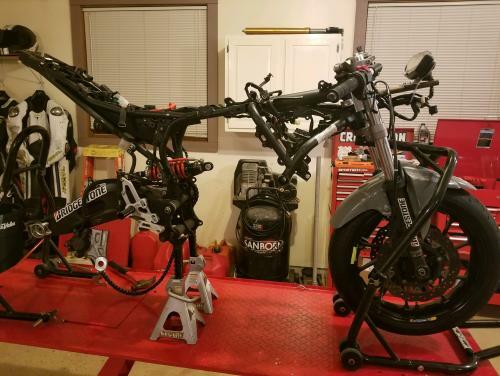 The goal is simple: take two bikes, tear them apart, mash parts together, and hope for greatness. 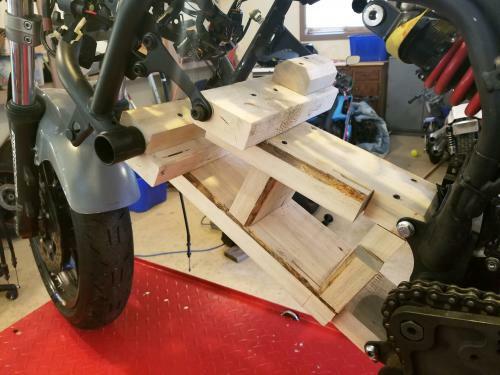 Hopefully the end result is a torquey twin with sportbike aesthetics. 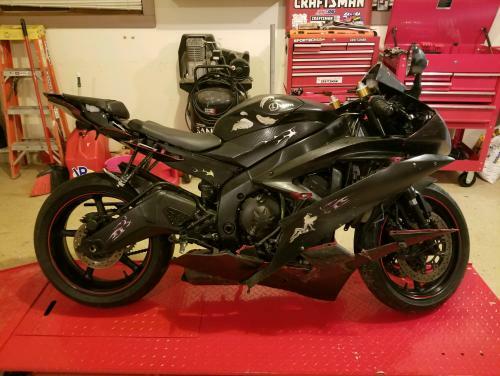 It took a while watching the market to find the right R6 donor bike. Top choice was something with a blown motor and thrashed bodywork so I could make it look my own without spending a ton or having to mess with parting anything out. Found a couple candidates over the summer with torn up fairings but running motors that were close to coming home. A couple weeks ago I found this gem. 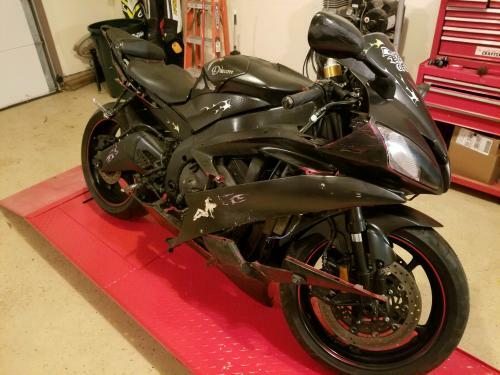 Frame, forks, and wheels appear straight, but most everything else is "well worn". 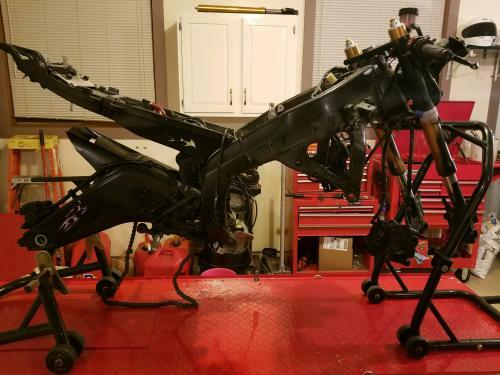 Celebrated New Year's in the garage tearing down the R6 and pulling the motor out of the race bike for mock up. 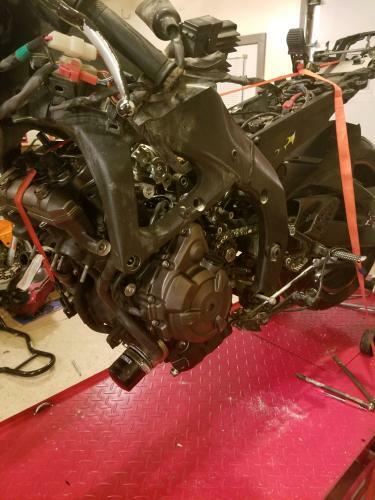 Once/If this works, I'll probably look for a salvage FZ to harvest the motor, wiring harness, ECU, and cluster from so I can put the race bike back together. Seemed foolish to make that investment up front. 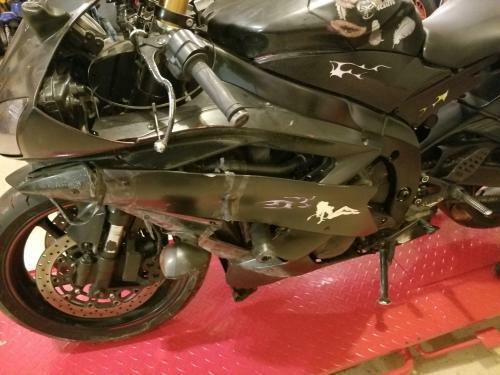 Worst case right now I can get my money back out of the R6 by selling the frame/forks/wheels if I have to. Awesome project! I naturally assume that you and Moto America BLR Team Owner are sharing notes along the way? Following. This project is right up my alley. 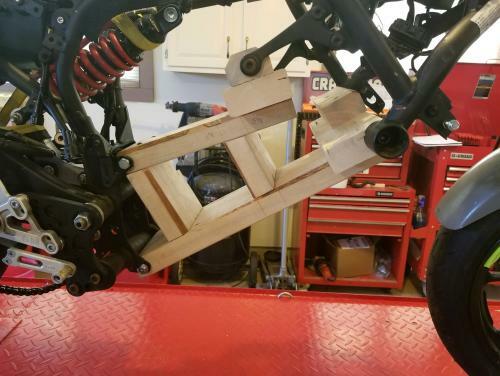 Built a quick template to get an idea how far off the mounts are without having to muscle the engine around. Initial thought is to use the lower rear mount direct engine to frame and make brackets for the other three. At this point my biggest concern was sprocket height. 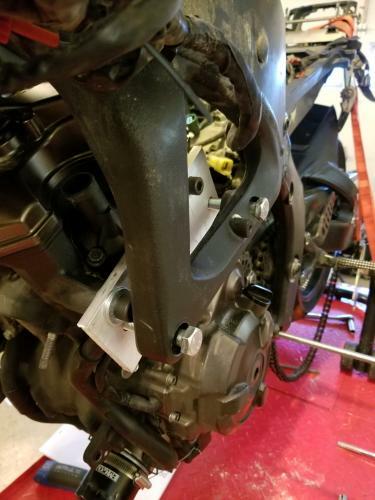 Some rough measurements with engines on the floor had the FZ sprocket around 3/4" lower/closer to the bottom engine mount. That much difference would have resulted in at the very least, excessive chain wear on the guide, and I would assume other negative impacts. It was hard to measure accurately without knowing exactly how the engine would be clocked in the frame. 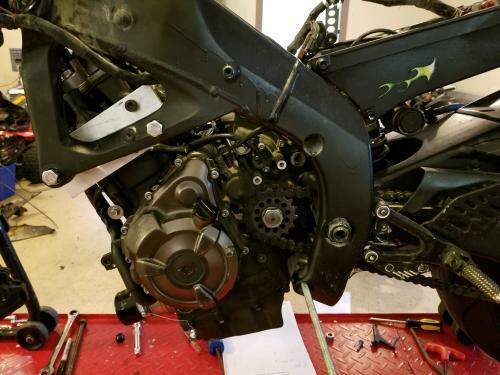 The further it's rotated clockwise, the higher the sprocket is. Starting to worry using the lower mounts direct might not be an option, I decided it would be best to swing the engine in and take a closer look. Built a quick jig based on the R6 motor that used the two rear mounts and centered a bolt on the sprocket. 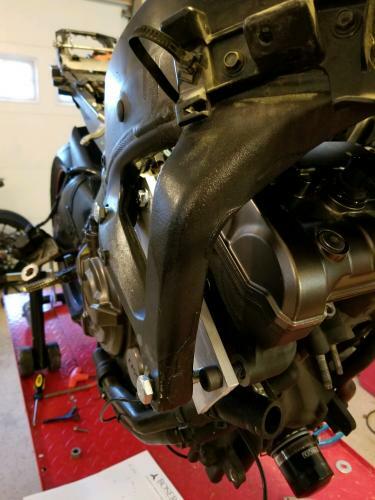 Sliding that over the frame with the FZ motor in place shows it's a lot closer than I thought. Might be able to get the engine rotated a bit more with a little grinding, but I'm not sure the gains are worth it. Cut some metal today. 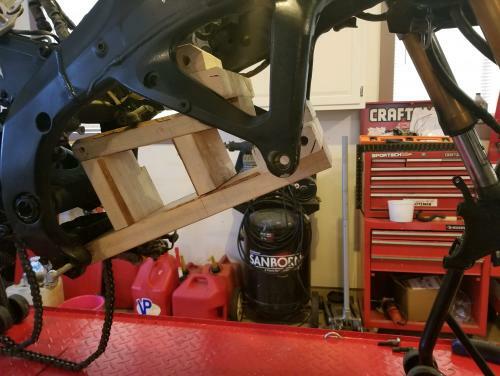 Upper/Front mounts are coming together nicely. Motor now sits in place solid without straps/jacks/etc. 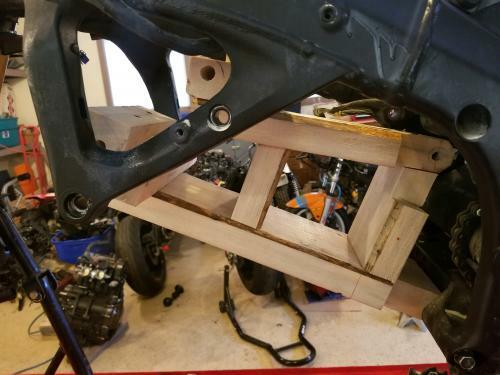 The difficult part is going to be coming up with measurements for spacers to accommodate the offsets on each side of the flat stock while keeping the engine straight in the frame. Can't just measure it sitting in the frame as you can still torque the engine slightly. 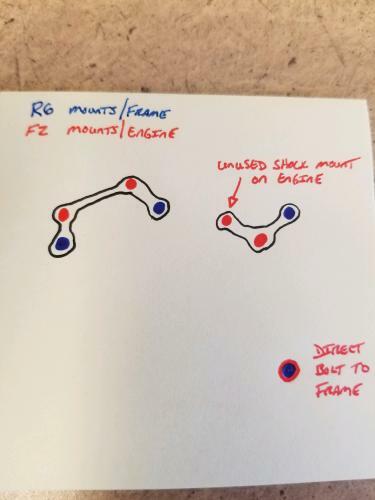 It doesn't take much flex to result in a few millimeter change in spacers. 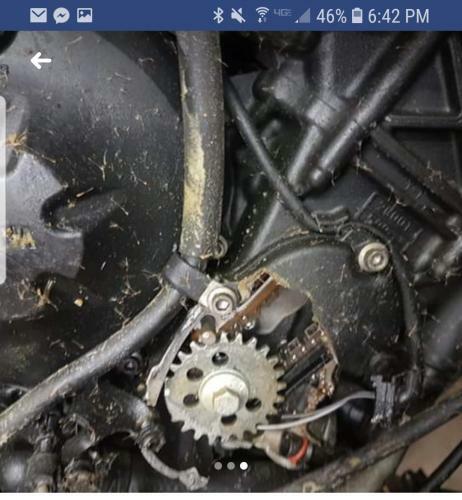 Maybe that wouldn't amount to enough sprocket angle change to worry about? All hail the new King of Schwing! Old school, no calipers or micrometers here folks, just a precision wooden Lego set. 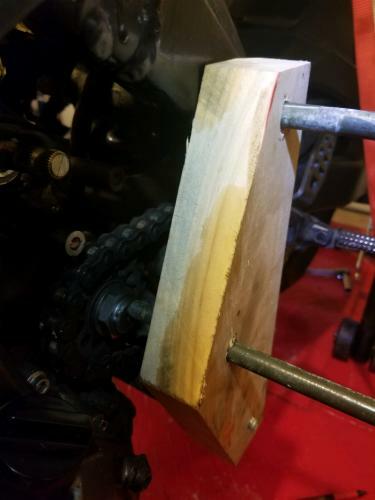 Well......once I started metal today I broke down and went calipers, degrees, millimeters, and of course a few choice words when I messed up the math and had to remake a bracket. Kids spent a good 2 hours in the shop adding nails, screws, and rope to my wood Lego set. It's now a certified bird trap hanging in our front yard. Major Kudos to you for even trying this. I'd still be flailin about the shop swatting at flames, lol. Kids spent a good 2 hours in the shop adding nails, screws, and rope to my wood Lego set. It's now a certified bird trap hanging in our front yard.